Birders reported a variety of unusual bird behaviors to eBird during the total solar eclipse this week, including birds roosting and nocturnal birds emerging in the middle of the day. Britain’s seabird colonies are in steep decline as warming waters disrupt their food supply, but a crucial study of their populations has been blocked. Studies of bone samples are shedding light on parts of the Dodo's natural history, including their breeding and molting cycles. Birders in the Mid-Atlantic (Delaware, Maryland, New Jersey, New York, and Virginia) are encouraged to complete a survey on non-consumptive coastal recreational activities by September 5th. Data from the survey will help guide management decisions by state and other agencies. A wild fire in Montana was blamed on a hawk carrying a snake that collided with a powerline and produced sparks. A study combining eBird observations with land-use and climate models suggested extra protections for forests on the wintering grounds of migratory birds. The Interior Department is recommending boundary adjustments for a number of national monuments. So far it has not revealed which monuments or how much of a reduction they will face, but early indications point to Bears Ears, Grand Staircase-Escalante, and Cascade-Siskiyou as the main targets. Read more about those monuments here. Reduction or elimination of any monuments would likely face legal challenges. Cascade-Siskiyou National Monument was expanded by President Obama to protect its biodiversity, including endangered species like Northern Spotted Owls. Bears Ears National Monument is notable for its archaeological and fossil sites. A tanker ship carrying liquid natural gas sailed from Norway to South Korea via the Arctic without the help of an icebreaker for the first time. The event shows both the loss of Arctic sea ice and the potential for toxic material spills in remote areas as more commercial activity happens in northern seas. A study found that the burden of climate change in the U.S. will fall disproportionately on states in the Southeast and Southwest. Alaska's permafrost is already thawing, and further thawing could contribute up to 1.7°F to climate change. A court ruled that regulators need to account for the potential greenhouse gas emissions from pipelines when evaluating their environmental impact. A federal report predicts climate change to produce 2.5°F of warming in the next few decades in the U.S.; the East would get wetter and the Southwest drier. Thousands of farmed Atlantic Salmon escaped from a pen in Washington state; the environmental consequences are so far unclear, but potential consequences could include the introduced salmon becoming invasive or spreading disease among local wild salmon. The state blames the escape on the solar eclipse. The Xerces Society has a new guide to native thistles. An entomologist is studying how climate change and other factors affect bumblebees in California. Environmentalists protested against the proposed border wall expansion in the Rio Grande Valley last weekend. Several sections of the wall would harm parts of wildlife preserves. A new study suggests that the temperature stability in tropical climates (as opposed to temperate ones) encourages a greater diversity of bird species. It is possible that a more stable climate makes it possible for birds to be highly specialized. Ireland is slowly losing its Eurasian Curlews, a species much celebrated in Irish literature and folklore. A new study suggests that the extinct Hunter Island Penguin, described from bones in 1983, was actually a composite of three different living species and thus never really existed. An ornithologist writes that learning the name of a species and how to identify it is the first step to a deeper appreciation of nature. A Bullock's Oriole that was captured two years ago in Ottawa has been rehabilitated and will be flown to British Columbia for release. EBird is doing its taxonomic update for 2017 this week, and lists may seem odd while it is in progress. Birding is rising in popularity among millennials. A new study finds that Reed Warblers can sense magnetic declination, which allows for east-west as well as north-south navigation. British Ornithologists' Union Blog: How many species is the Pectoral Sparrow? 10,000 Birds: Will Environmental Laws Prevent a Wall Through Santa Ana NWR? During Trump's bizarre press conference on Tuesday, he signed an executive order that included a rule overturning an Obama-era rule that planning for infrastructure on flood-prone properties must take account of sea level rise. The rule change contradicts how he has treated his own properties. The EPA will also end restrictions on water pollution from coal-fired power plants. A great deal remains unknown about frog reproduction, but what is known suggests great variation among frog species. If hunting of Grizzly Bears is allowed in the Yellowstone area this year, up to 20 bears could be killed in the area immediately around the park. A critical question is whether the Yellowstone bears will ever expand their range enough to reconnect with populations in the northern Rocky Mountains. An Exxon Mobil refinery in Beaumont, Texas, is a good example of how toxic industries are often sited near poor or minority neighborhoods. Young conservationists are being driven out of the profession by a lack of stable paid work. Several business coalitions are urging Ryan Zinke not to reduce or rescind national monument designations since the monuments provide an economic boost. A federal pollinator task force is considering using I-35 as a corridor for prairie restoration to provide habitat for migrating Monarchs. While New Jersey's Pinelands region is protected, its Kirkwood-Cohansey Aquifer still faces threats from development and climate change. The Keystone XL pipeline now awaits a decision by Nebraska regulators, but a recent hearing did not allow for testimony about its most important problems, such as safety and environmental effects. This week, New Jersey removed a dam along the Millstone River to increase migratory fish habitat. 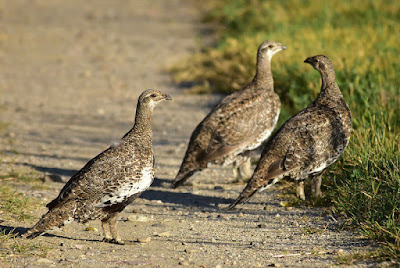 According to a recent study, livestock grazing and roads have worse effects on Greater Prairie-Chickens' nesting success than wind energy facilities. This week the Interior Department weakened protections for sage grouse that had been implemented to prevent endangered listing during the Obama administration. The preen gland of birds like Zebra Finches gets larger during the breeding season. Isotopes in penguin feathers can reveal their migration route. As the desert Southwest’s heat waves grow hotter, bigger and more frequent, songbirds struggle to survive. Sandpipers are already on their way south. 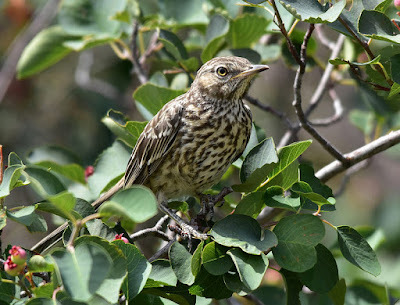 Here is an article about birding the New Jersey Botanical Garden. 10,000 Birds: More than a mouthful can be a really bad thing! The USDA kills thousands of animals (both wildlife and pets) each year with cyanide bombs, which kill indiscriminately. USDA has also begun censoring use of the term 'climate change' under the new administration. Artificial lights discourage nocturnal pollinators from visiting nearby plants. American Pikas are adapting to climate change by changing their foraging behavior and making use of different habitats, which are among several adaptation strategies documented in wildlife. Citizen scientists can help answer questions about how wildlife is adapting (or not) to climate change by collecting data. Contractors for the border wall cleared a portion of the privately-owned National Butterfly Center without warning. This article has a map showing where the new border wall sections will be built, including the sections in the National Butterfly Center and Santa Ana NWR. Significant climate events in the U.S. in July included unusually heavy rains in the Midwest and Northeast and unusually hot and dry conditions along the Pacific coast and Alaska. The PennEast pipeline is likely to move ahead now that FERC has a quorum. Natural barriers like restored dunes and saltmarshes can help save cities from rising seas where traditional seawalls are inadequate. Birds that rely on camouflage consistently choose resting places that blend with their individual appearance. EBird has a map showing the Wood Thrush's migration and range. 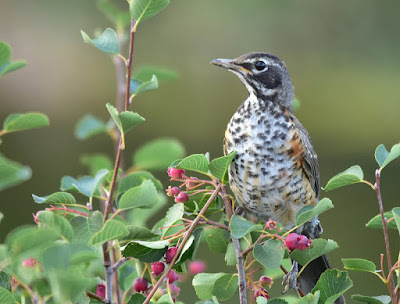 One issue in interpreting the map is that Wood Thrushes become harder for birders to find in late summer, so they seem to disappear even though they are probably present. A study across 40 college and university campuses found that about one bird per day dies in a collision with campus buildings in North America. This year's State of the Birds report focuses on birds helped by the Farm Bill. The Great Salt Lake is about half its natural size, which reduces habitat for migratory wetland birds. The program to restore Whooping Cranes is shutting down due to federal budget cuts. EBird is making it easier to change species on observations with field notes or uploaded media. PSE&G is building a 75-foot-tall cage around a methane flame at Kingsland Landfill in the Meadowlands to keep raptors from being injured as they fly over it. Isotopes reveal that Myrtle Warblers that winter on the Pacific coast breed in Alaska and Yukon, which means they have a much shorter migration route than if they wintered on the Atlantic and Gulf coasts like other Myrtle Warblers. A survey of New Britain found that some species were doing better than expected but other vulnerable ones were not seen at all. A new study links parrots' consumption of clay to their nutritional needs during the breeding season, particularly their need for extra sodium. Black-crowned Night-Herons were recorded breeding in Great Britain for the first time. The birds were probably drawn north by a combination of wetland restoration and climate change. Like bats, oilbirds use echolocation to navigate. A new study has proposed a reconstruction of the ancestral flower. Foxes and other predators of small mammals could help reduce Lyme disease by discouraging mouse activity and making it harder for tick nymphs to find their first blood meal. The budget passed by the House would allow oil drilling in Arctic NWR, which would threaten biodiversity and indigenous livelihoods. A new study argues that conservationists do not make as much use of evidence from peer-reviewed research as they could. A company wants to pump groundwater from the Mojave Desert to supply cities in southern California; environmentalists and others oppose the project for the damage it could do to natural springs. A federal appeals court has reinstated protections for the Great Lakes population of the Gray Wolf, but a bipartisan group of lawmakers is working to remove them again. Extending or modifying the border wall could put 100 endangered or threatened species at risk by blocking their movements or destroying their habitat. Meanwhile Homeland Security has waived environmental regulations for a portion of the wall near San Diego. A contractor for the border wall started clearing trees on the National Butterfly Center, a privately-owned nature reserve. Light pollution disrupts pollination by moths and other nocturnal pollinators. This year's dead zone in the Gulf of Mexico, which kills fish and other marine life, is the largest ever recorded. The rare Quino Checkerspot is flying again at San Diego NWR thanks to habitat restoration and a reintroduction program.